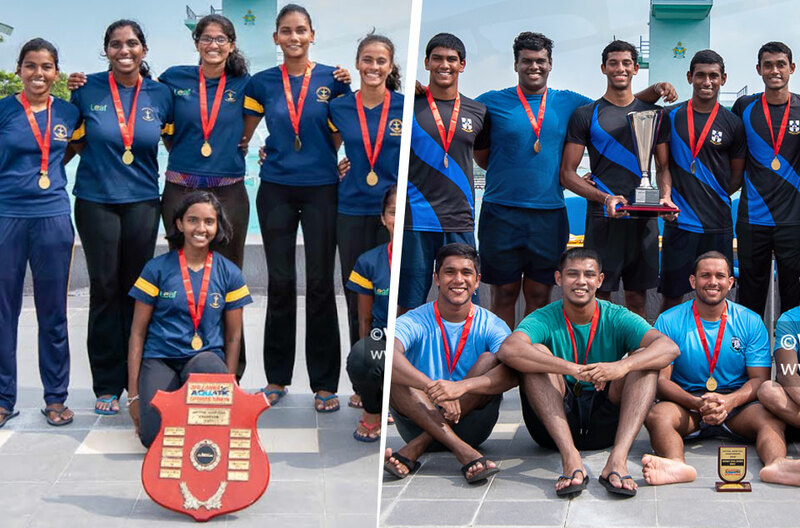 Adithya Perera and Akithmi Wasalathanthri take not just Gold but a national record each on the 3rd day of the National and Junior National Aquatic Championship 2018. The third day of the National Aquatic Championship 2018 drew its curtains with 4 National Records in total, two individual and two relays. 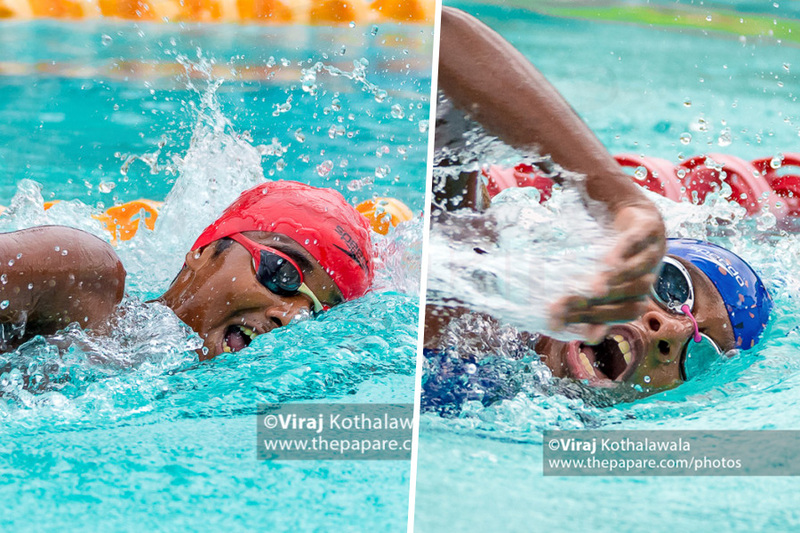 Adithya Perera and Akithmi Wasalathanthri claimed records in the Boys & Girls Under 15 100m Backstroke respectively. Adithya Perera of De Mazenod College struck the National Record in the Boy’s U15 100m Backstroke with a time of 1:04.11 minutes. The previous record was held by Shevinda Silva of St. Joseph’s College (1:05.57 mins) at the 2016 National Championship. Adithya also took home Silver in the Boy’s U15 50m Butterfly event, 28.40 seconds. He was surpassed by young Nalandian, Kaveesha Gimhan Silva clocking 27.22 seconds. Although this was Adithya’s first Record breaking performance in this year’s competition, he was already the recipient of 2 Gold medals on the first two days. He won Gold in the 50m Backstroke and the 200m Backstroke events. Akithmi Wasalathanthri’s record breaking performance came in the Girls under 15 100m Backstroke event with a timing of 1:12.64 minutes. The previous record in this event was held by Ganga Senevirathne of Visakha Vidyalaya with 1:12.99 minutes. Minagi Rupesinghe of St. Bridget’s Convent came in second clocking 1:14.23 minutes. Akithmi had also won Gold in the 50m Backstroke event yesterday and the Silver in the 200m Backstroke event. Akithmi’s performances has been instrumental for Lyceum International School Wattala as they hang on to their lead in the team scorers in the Junior National category. Hiruki De Silva of Gateway College Dehiwala has had a splendid run so far winning four Gold medals and one silver. Her latest was placing first in the Girls Under 15 800m Freestyle event with a massive gap, almost of over 17 seconds. She also won Silver in the 100m Freestyle event after a closely contested defeat to Gayathmi Wijeratne. Youth Olympic star, Akalanka Peiris of St. Peter’s College grabbed his third Gold in the three days of competition, this time in the Boys 100m Backstroke event. His timing of 58.05 seconds was more than enough to sweep Santhush Mahishan who finished 2nd clocking 1:01.52 minutes. 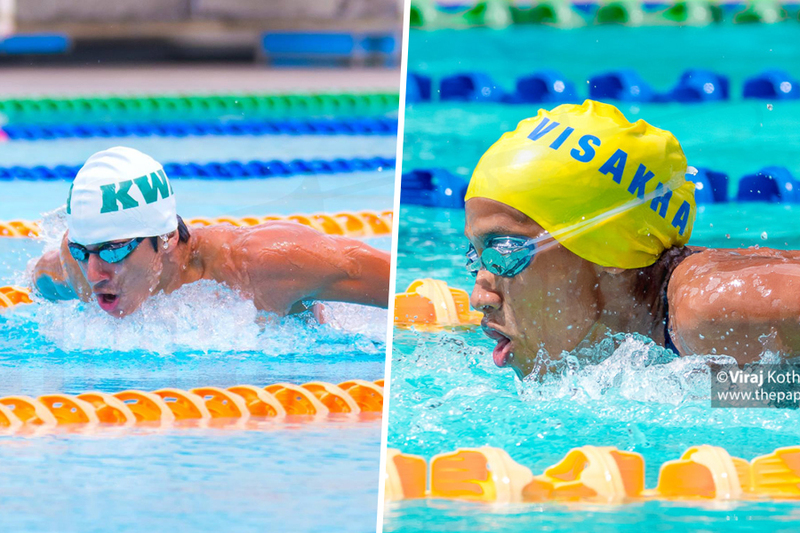 In the relays, Visakha Vidyalaya and Lyceum International School Wattala claimed two records in the 200m Freestyle and U15 400m Freestyle events respectively. 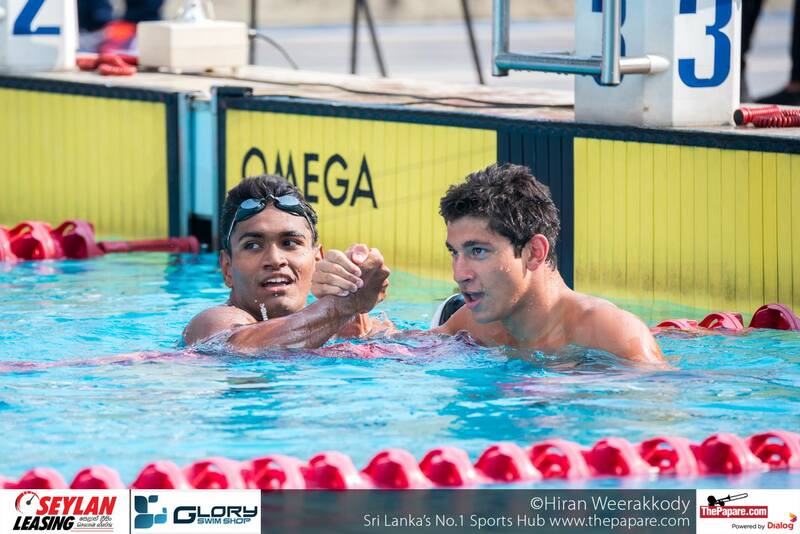 The Visakhians dominated the senior 200m Freestyle event, bettering their own National Record, with a time of 1:56.62 minutes as opposed to the previous 1:58.53. Mahamaya Girls College came in second clocking 2:03.50 minutes and Musaeus College followed behind finishing third. With 4:35.13 minutes, Lyceum International School Wattala broke the Girls U15 400m Freestyle record, previously held by Visakha Vidyalaya. Sirimavo Bandaranaike Vidyalaya and Visakha came in second and third respectively. Lyceum International School Wattala is still in the lead in the Junior Girls team scores with 130 points. Sirimavo Bandaranaike Vidyalaya follow close behind with 120 points; St. Bridget’s Convent and Visakha Vidyalaya are in third and fourth with 84 and 81 points respectively. Nalanda College increases their lead from day 2 over St. Joseph’s College. They now stand with 132 points as against the Josephians who finish day 2 in second place yet again with 96.5 points. St. Peter’s College and Ananda follow with 82 and 60 points. Mahamaya Girls College has still not been able to shake the Visakha curse in the Senior National category and the Visakhians remain first with 197 points. Mahamaya follows second with 107 points while Lyceum International School Wattala (77) hold on to third place with a 7-point lead over Sirimavo Bandaranaike Vidyalaya (70). Defending champoions, Killer Whale Aquatics remain on course for their second National title with 185 points. Ananda College also enter the triple digits with 103 and is in 2nd place, while Gateway College Colombo finish the day in 3rd place with 88 points. With one more day of exciting action to hit the Sugathadasa waters, will Visakha Vidyalaya have the strength to hold on to their top position to be crowned new National Women’s Champions? Stay logged to ThePapare.com to find out!